BFG Ageia PhysX graphics accelerator card is the first Physics processor from BFG, which is among few manufacturers that are manufacturing and selling physics processors, the other vendor been ASUS. 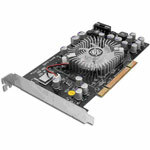 BFG Ageia PhysX gaming card feature Ageia PhysX PPU (Physics Processing Unit) or discrete physics processor and has 128 MB of GDDR3 memory. Ageia PhysX PPU is a new expansion chipset and SDK that designed to perform complex physics calculations to generate more realistic and detailed graphics. Sci-Tech Today reviews Ageia PhysX graphics accelerator from BFG, gives the graphics card rating of 3 out of 5 and concludes that despite the impressive visuals enabled by the PhysX PPU, it is very hard to look past the fact that the technology is still in its infancy and has not been adopted by very many game developers. We are hopeful that some game companies might go back and offer new versions of hit games, but no companies have yet stepped forward, likely due to high development costs. Check out more reviews of BFG Ageia PhysX graphics accelerator.